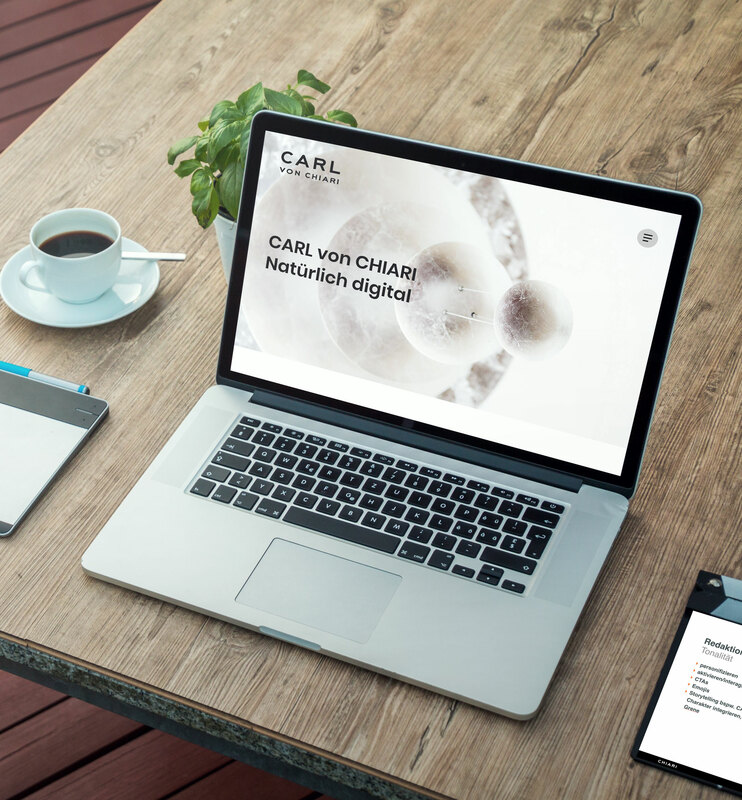 CARL von CHIARI needed a brand identity, a matching website and touchpoints, build to communicate all the aspects and services of the company. Creation of a new company. CvC as CHIARI’s spin-off for digital media. 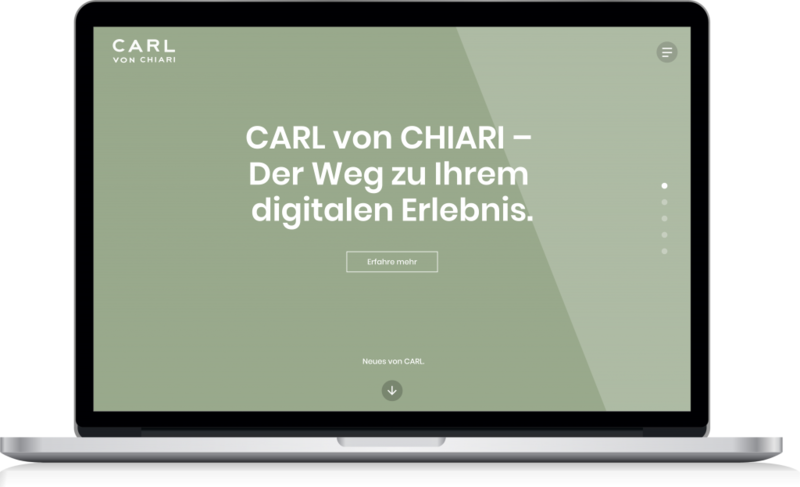 As a spin-off of the CHIARI brand communication, CARL von CHIARI (CvC) takes over the digital department and creates digital communication from the first strategic planning to the final digital experience, while still being connected to CHIARI. 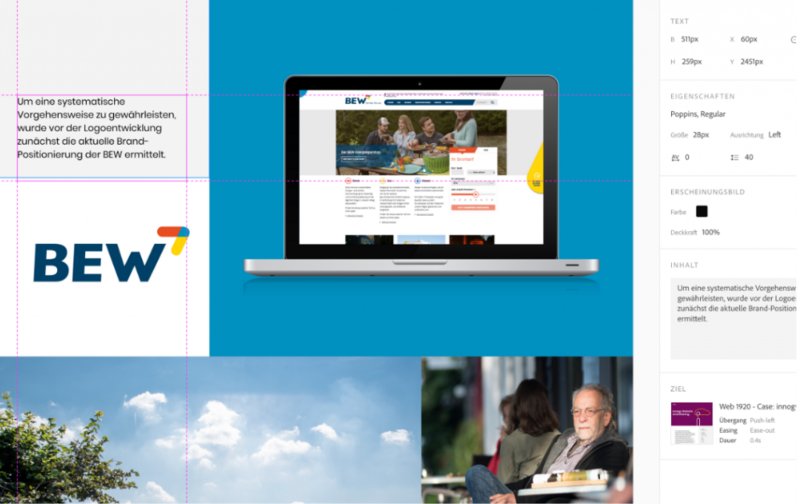 To introduce CvC a brand concept had to be created that met the needs of the company as well as the needs of the target groups. 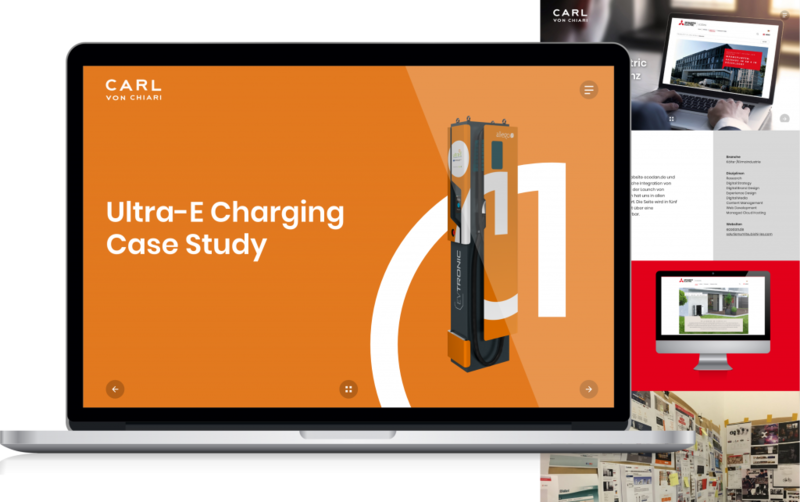 This included not only a corporate design and a website but also the design of various touchpoints, such as a company presentation, social media strategy and customer gifts. Therefore, both strategy and design had to be chosen to be applicable to all media and easily expandable to reflect current trends. 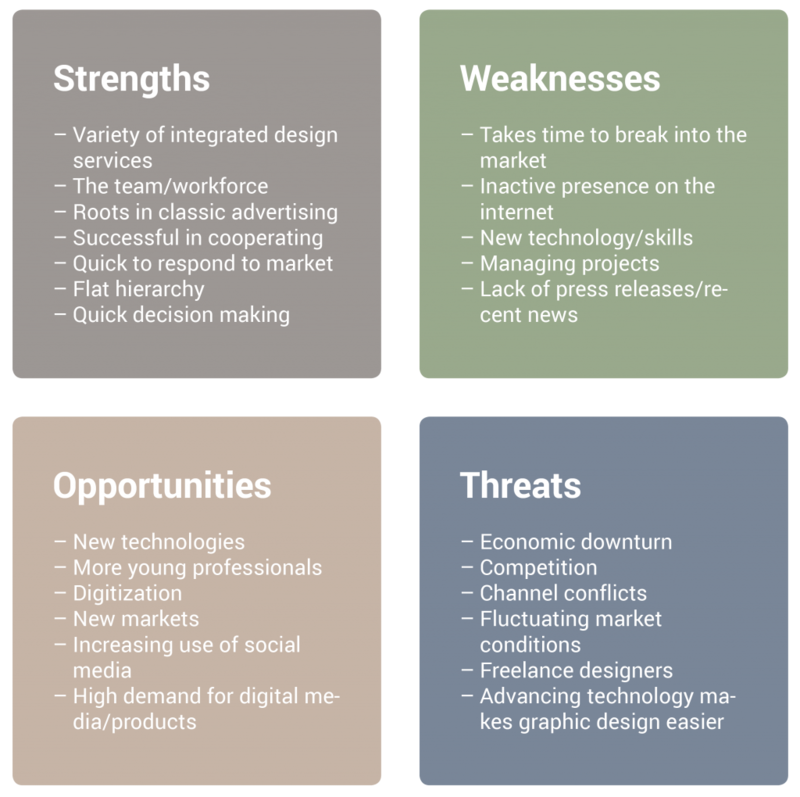 Among other analyzes like benchmarks or user journeys, the SWOT-Analysis was carried out in order to be able to define the identity of the company more precisely and to include this in the concept. Questions like “In which areas should we improve?” or “What do we want to achieve?” were answered and used in the further course of the concept phase. 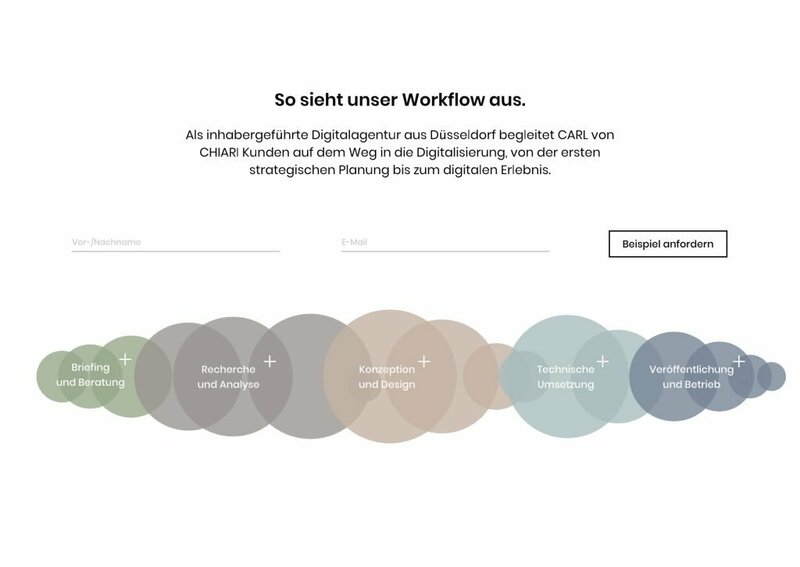 It was clear that CvC wanted to be able to show off their great expertise and knowledge as a modern digital agency with roots in classic advertising as well as to be able to react to different trends, future technologies and user needs. The balancing act between modularity and exclusivity. Who wants to explore the universe, should know exactly what he does. These concept criteria were especially important to us, because they were also the main problems to be solved. Different testings helped to find out which way would work out best. 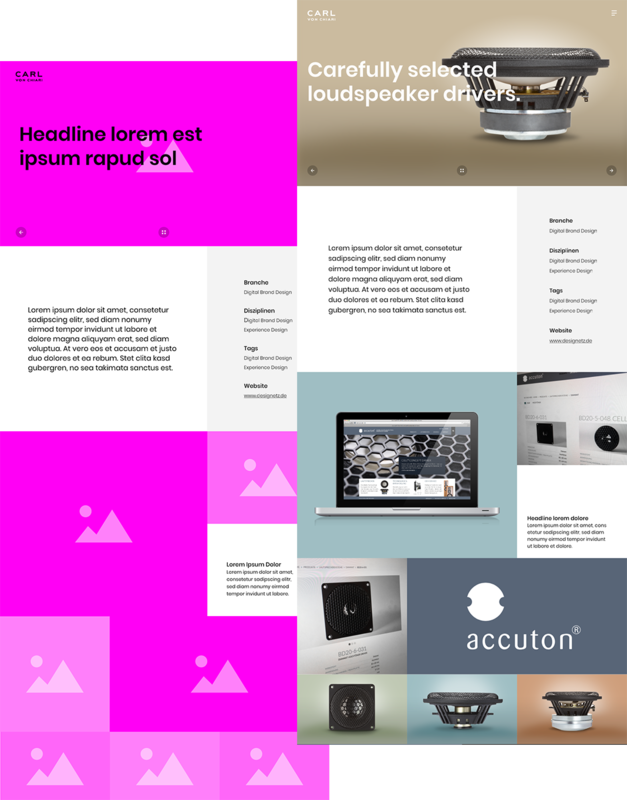 One of the biggest goals for the website design was to keep it modular. The website needed to work for any kind of project and for anyone that would implement new projects. Project analyzes and benchmarks made clear that a boxing look needed to be created. 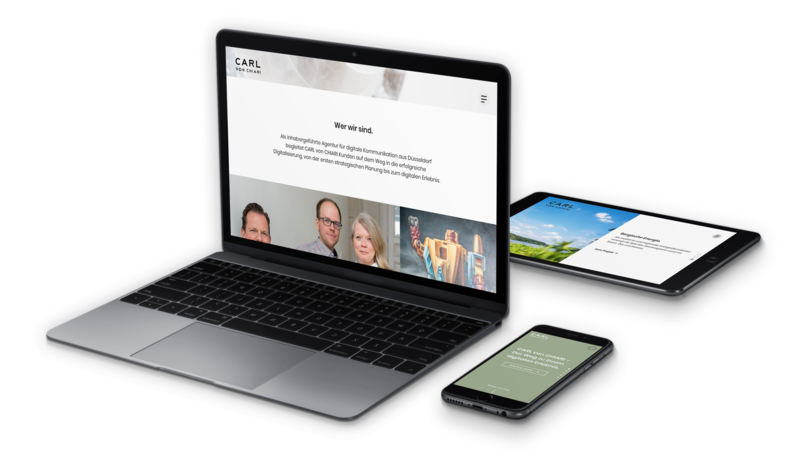 In order to be able to react to the latest trends as a modern agency, it was important to create a corporate design that was open for transformation. That's why I saw the CD as a white canvas that could react to anything without being distracted by limitations. The website should be easy to handle even for those who maintain it. Despite the openness of the design, the site had to follow a clear structure that is easy to understand and maintain. The project pages were designed to always follow a specific pattern and contain similar information. Since the site was supposed to shine with high-resolution images and videos, we had to make sure mobile viewers did not have long loading times or consume too much data. Therefore, an AMP version should be created with reduced content, which also achieves a better Google ranking. 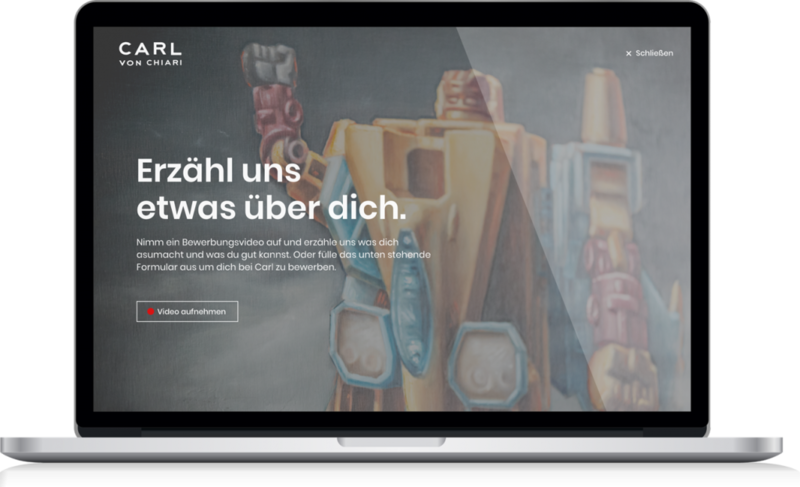 To give the site additional dynamism and exclusivity, we focused on animations and interactions. To further promote the interaction between user and website, a concept for an interactive job application process as well as a transparent client data generation needed to be implemented. 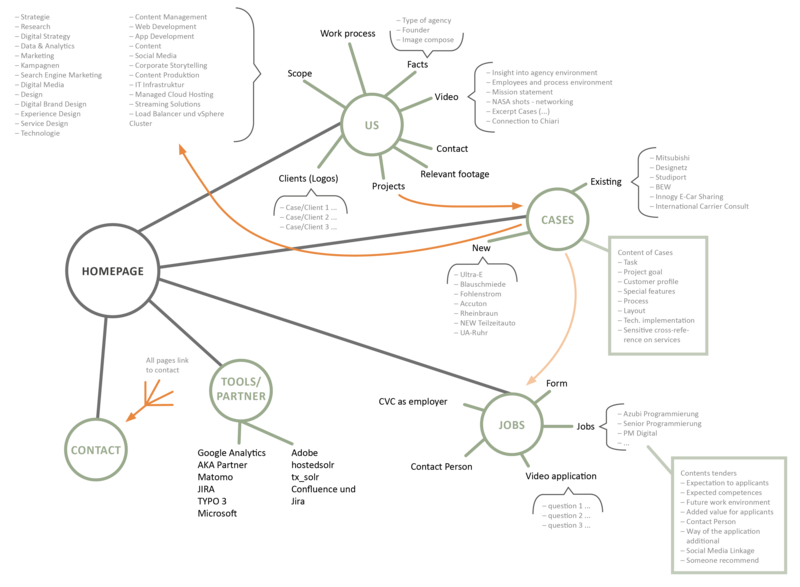 To get a clear overview of the sites content, features and connections a site formula was drawn. To consider all eventualities, a lot of wireframes were created. It was all about giving the boxing a precise structure but keeping it equally fexibel. This principle has also been applied to entire pages to ensure a consistent appearance as well as easy handling. To keep a connection between the companies, the CHIARI font was used for the word mark. Furthermore, a picture mark was designed. 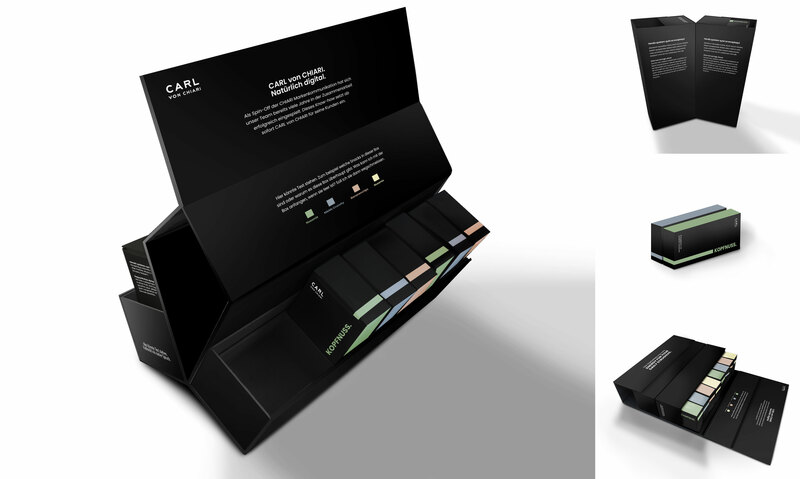 For the color palette, the main focus was on black, white and sage, in order to let the images and colors of the projects speak for themselves. This also helped to create a white canvas to respond to current trends. Nevertheless every company needs a few accent colors from time to time. Therefore, the muted colors below were selected. Design is a process. Often, the initial design changes in the elaboration because new ideas, decisions or functionalities are added. Every detail has to fit and give as much cause for wonder as the overall impression. The homepage is divided into slider sections that introduce the websites topics. It makes it also possible to integrate news or to specifically adress users for example around christmas. Let the projects speak for themselves. The boxing was mainly used for the project pages, to give every site a consistent look and to simplify the rebuilding of projects. The contents of the blocks can vary as they have been programmed with the purpose of always being variable. 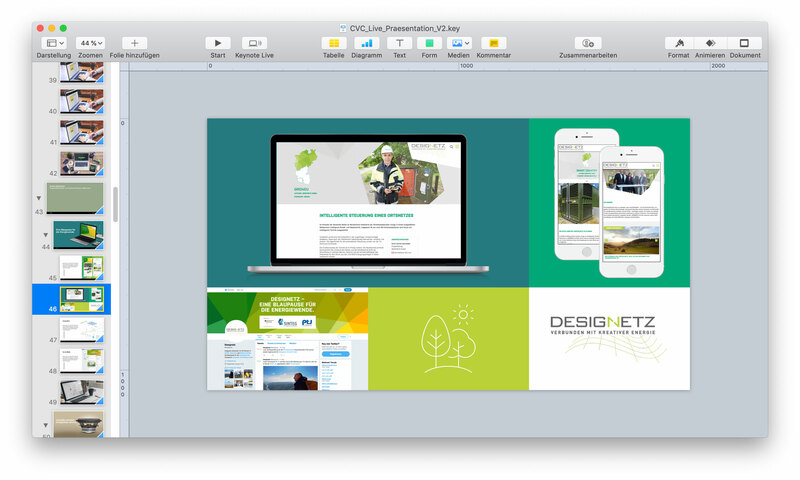 With the withdrawn corporate design, a stage for the projects and their different characteristics was created. Job applications should make fun. To simplify the application process for both the applicant and the company and to make it more playful, a video application was implemented. The candidate gets questions that he can answer directly in the step by step process on the website within a video. If the applicant does not want to be filmed, he still has the option of completing a form or sending his application by e-mail. An important part of delivering is that a project isn’t over yet, just because the designer deliverd specifications and assets to the developers. Therefore, the implementation of a website is always accompanied and driven forward. By creating prototypes with programs such as Axure or Adobe XD, it is possible to save design specifications and click paths to give the developer an accurate overview. To make it even easier, the smallest details and special cases have been described to cover all programming possibilities. The afterdesign and evaluation is always an important step to keep track of what needs to be improved or what worked out best. That is why we started back at the beginning, to evaluate the process, outcome and to make it even better. More features were created to be added. For example, business process infographics to create customer understanding of the time, dedication, and resources needed for a successful project. 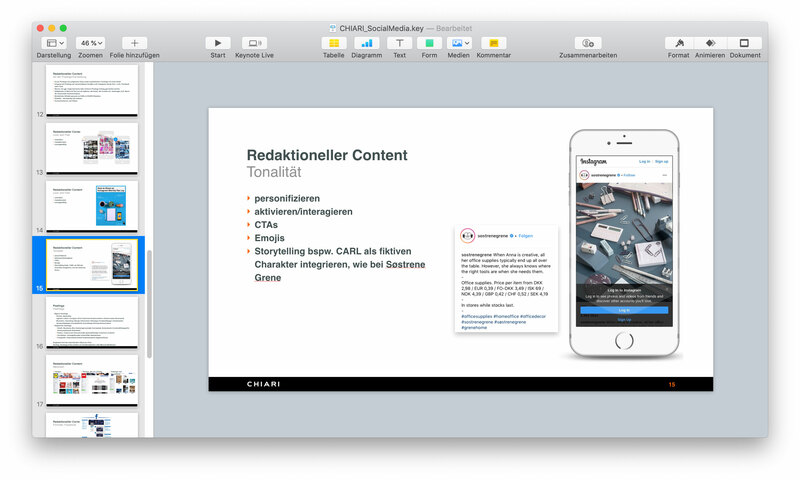 In order to present the newly founded company within meetings or for customer acquisition, a keynote presentation was created. To ensure a holistic appearance across all platforms, the design of the website was adapted for the presentation. In order to revive old customer relationships and start potential new customer relationships with a smile, customer gifts were designed. With cheeky slogans, sustainable packaging and snacks as well as writing material for company employees, a lasting impression was made. To promote CvC a social media strategy had been developed that is tailored to the specifics of the company and its appearance. Possible subjects, colors, imagery and tone of voice were defined. To continue the brand experience within the agency premises, a plan for a fresh interior design was made. New pieces of furniture to create an inviting waiting area, as well as the look of the bare walls, which should now be equipped with pictures of past projects, were included. 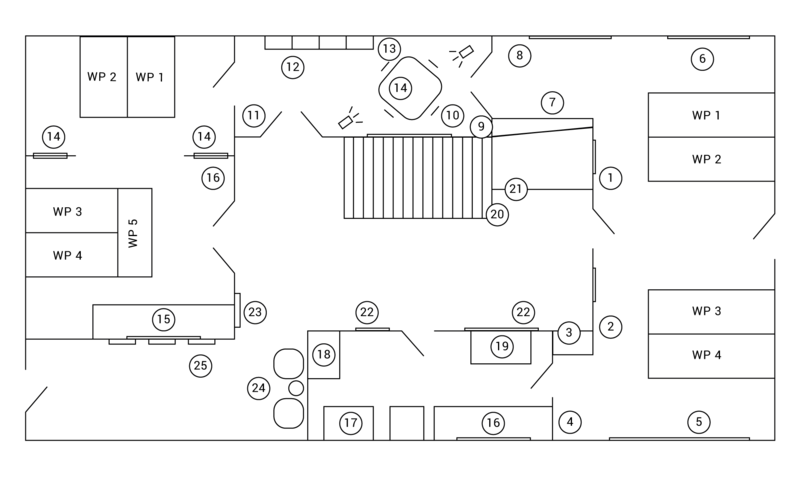 Below you can see the first room sketch in which numbers have already been noted in order to show where pictures and furniture should be placed. During the structuring of CvC, the company created open source extensions, each of which needed its own platform. These platforms should be stand-alone, but based on the well-known design of CvC. Furthermore, unique icons for the extensions were created and an overview page of the extensions, which are integrated into the actual website.